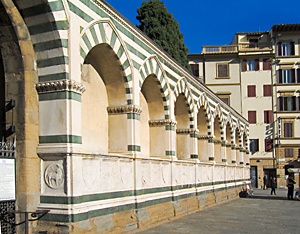 Santa Maria novella - FLORENCE LIVE! 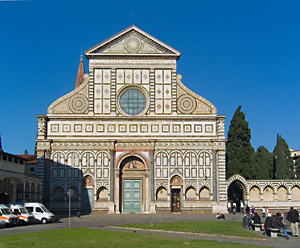 Santa Maria Novella is chronologically the first of the great Florentine basilicas. Its name, "Novella", comes from the fact that it was built on the site of a 9th century oratory, called Santa Maria delle Vigne, which had already been enlarged in 1094. In 1221 this church and the surrounding area was assigned to the Dominican monks, who immediately began to transform it. Construction started on what were to be the sumptuous headquarters of the powerful Dominican Order in 1246; designed by two architect monks, Fra Sisto Fiorentino and Fra Ristoro da Campi, it was completed in 1360 under the direction of Fra Iacopo Talenti, who also designed the Spanish Chapel or chapter house (1350-55), the convent Refectory (1353) and the great pointed belltower in Romanesque-Gothic style (1330). The elaborate facade of inlaid black and white marble is a real masterpiece: it was started in 1300 and later completed by Leon Battista Alberti in 1470.